If you are a moderate to heavy social media user, like most of us at Palawan News anyway, you would have chanced upon a recent viral post about two women being interviewed by media on why they were rooting for a certain senatorial candidate who had been involved in a Malampaya plunder case but was granted relief by the courts. The interview was in situ, and the two women were evidently giddy at being part of an evolving development related to the opening day of the campaign period for national candidates. They were being asked by the interviewer what platforms they liked about their candidate, and what they thought about him being linked to massive corruption allegations. Their response was candid and forthcoming – they simply decided he was “gwapo” or physically attractive and thus deserving of their vote. The sadder part of the interview’s post mortem was the bashing the two received from netizens, ostensibly for making wrong decisions and for flaunting their alleged lack of wisdom. A more compassionate view would have been to appreciate their honesty and bravery to expose their personal views to the public to criticize and comment on. After all, not one Filipino could and should claim to be beyond making wrong choices. We as a people are collectively responsible for the kind of politics that we practice, and ultimately the quality of life we have had to live with. Society bears the burden of the results of our every election, whether we elected the wrong person in power or failed to do our part in raising our level of consciousness to discriminate issues and vote for the better candidates. The results of every polling are simply the sum total of good versus bad decisions, a reflection of our political maturity as a people. As the campaign period for the mid-term elections begins this week, we are facing yet another diagnostic test; and judging by recent advanced polling results, we are likely to simply reaffirm our usual practice of dealing with elections and election-related issues. That any election is but a passing sideshow that has little or nothing to do with our individual long term lives is a fair conclusion to make, on the basis of how we have placed candidates in power. The two women who gushed for that certain senatorial candidate will simply go on with their lives after the elections, happy enough that they have rubbed elbows with a handsome candidate. It’s no different from anybody else who regard the elections as nothing more than an opportunity to make a small buck or to bring food to the table. It takes a real effort to be able to discern a political candidate based on their track record of public service and their capacity to contribute to better governance and therefore better lives for all of us. For some, gut feeling is more than sufficient to make such decisions. For others, whatever they decide is the correct candidate, no matter what the evidence say to the contrary. 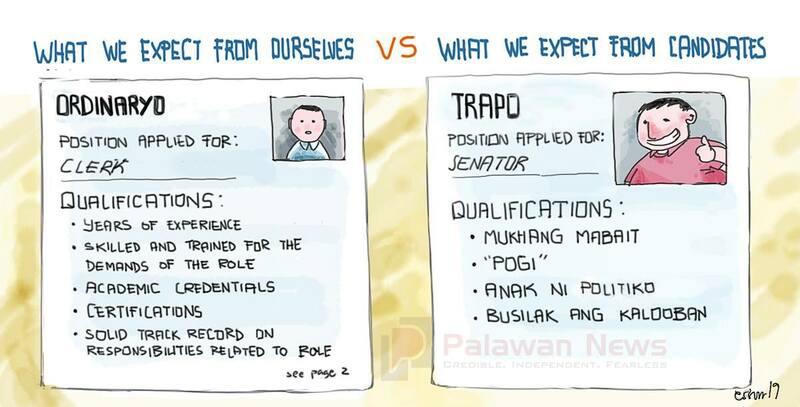 The only simple trick we can offer the electorate, particularly in Palawan where some 600,000 individuals are registered for a chance to make their votes count, is to formulate a question on one’s mind focused on a candidate’s integrity, ability and the sensibility of his or her vision of governance. On the basis of such question, and not on the basis of political affiliation, we then must cast our votes. It used to be easier said than done, but in this age of the internet and social media, and information overload, it is possible to discern.